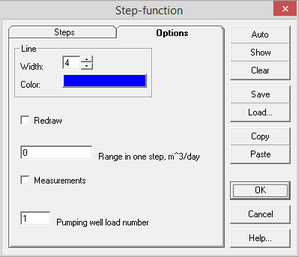 Hydraulic diffusivity estimation by graphic method of bisecting line is available from the "Bisecting line method" dialog box. 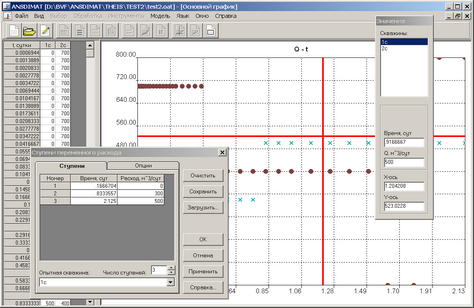 The dialog is launched from the main menu "Analysis > Bisecting line method" or right mouse click in the lower right corner of the graph window plotted by bisecting line method. "Bisecting line method" dialog boxes. The result is displayed on the plot of drawdowns in two observation wells: ratio of measured values is plotted on the ordinate while calculated values ratio on the abscissa. Plot window for parameter estimation by method of bisecting line. If hydraulic diffusivity values are deteremined correctly, plotted points lye on the diagonal line, if not, deviate from it. 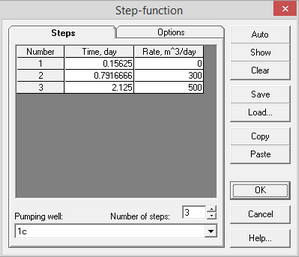 To inverse the ratio and change the ordinate axis (s1 / s2 change to s2 / s1) use "Tools > Inversion" menu.